There is a first time for everything. First breath, first tear, first love, first heartbreak first job, first flight, first time visiting another country literally I could list an eternity of firsts but the question I have for you when was the last time you did something for the first time. Doing something for the first time means you are trying something new, you are branching out you are extending your comfort zone. Often experiencing something for the first time requires growth, whether it be spiritual, physical, mental or romantic growth is change. Don’t be afraid to try new things and experience a new first. With firsts you have to think about the consequences I am not saying your invincible and that you should go out there and put your body on the line. I am saying to enjoy life do the things that make you happy and that you think could make you happy. If you try it and you don’t like it that is totally fine. It’s really important to know your boundaries and not to cross them. You’re never going to regret waiting for something. You could possibly regret rushing into something too soon but you will know in your heart when the time is right. If you’re asking yourself if the time is right chances are the time isn’t right don’t be scared to delay this first. When you first involves another person maybe they’re more ready than you are, they might have more experience than you. For them it might not be their first. Don’t be shy be open and honest about the experience, the nerves what it means to you. Whether it’s a kiss or something more there is nothing bad about saving that for someone super special. If ever someone is trying to pressure you to do something that you’re not entirely comfortable with don’t ever be afraid to say it how it is. It’s as simple as saying I’m not sure about that I don’t know if I am ready. If they then try and reassure you in a pressuring way just say. You putting pressure on me makes me want to do this less. Just give me time and I will let you know when the time is right. Someone that cares about you will understand where you’re coming from and will allow you the time that you need. I hope you have an amazing weekend what ever you have planned for yourself. 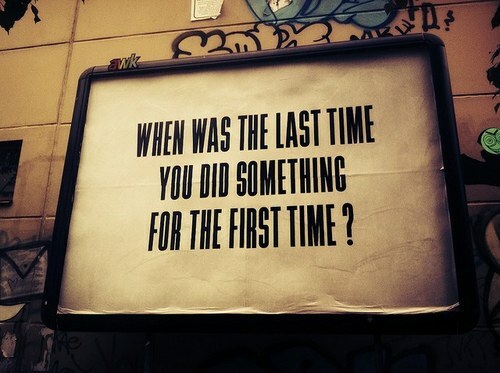 Think about something you’ve never done before and go do it! Stay safe and be kind to one another!